Tactical Communications Market size was estimated at over USD 20 billion, with shipments of over 60 million units in 2016. 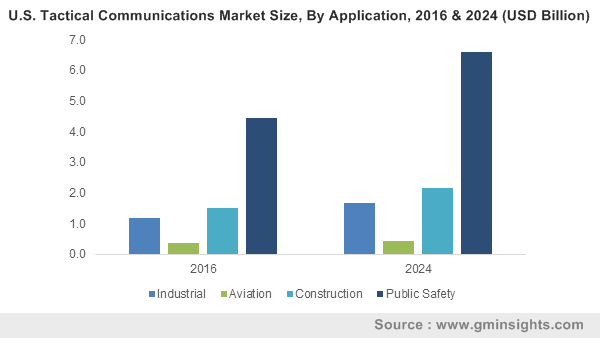 Tactical communications market is anticipated to experience substantial growth owing to the high emphasis on providing protective equipment and the requirement of constant communication in sectors such as the military, construction, public safety, etc. The high noise exposure to continuous, loud sounds can have long-lasting negative impacts on the hearing of the workforce. Miniaturization of the equipment and technological advancements such as the development of ear canal earphones, active and passive noise cancelling devices, and the improvement of connectivity technologies is anticipated to propel the tactical communications market demand. Adoption of LTE technology in professional mobile radios (PMR) systems has allowed real time data interchange and the transmission of complex video and voice data. As bulky material is harder to handle and places additional, unwanted weight on the user, consumers seek equipment that will not hamper their functionality. Wireless is gradually replacing wired technology owing to the freedom in movement and the increased comfort that it provides. To tackle the issue of miscommunication in high stress environments, an increasing number of companies in the tactical communications market are improving digital signal processing (DSP) and compression technology to filter out ambient sounds. Bone conduction technology has revolutionised the global tactical communications market by allowing users with hearing impairment to function efficiently in the workplace. The tactical headsets in tactical communications market is projected to exhibit high growth during the forecast timespan. Headphone technology is integrated into helmets to provide increased protection to construction and industrial workers. Furthermore, headphones are available with noise cancelling features that can dull out, ambient sounds and protect the user’s hearing capability. A major factor contributing to the growing earphones/in-ear tactical headsets market sales is the demand for lighter, communication technologies. Earphones are highly efficient in covert situations where equipment such as these can compromise the situation. The professional mobile radio product segment in tactical communications market is anticipated to dominate by revenue share as they allow multiple parties to relay information to the main control unit and stay connected. The penetration of PMRs is very high in the public safety segment as SWAT teams, military and navy personnel, and others are required to use constant communication during the mission. The public safety applications in tactical communications market are anticipated to dominate in terms of revenue due to the high adoption by military and police personnel. Hindrance in communication can cause severe repercussions for the entire team and the mission. There is a high emphasis on light weight technology that has multiple connectivity options and can be used at high temperatures and in underwater settings. Adoption of headsets in the industrial and construction sector is projected to experience a high growth during the forecast timeframe fueling the demand for tactical communications market. Rapid industrialization and the movement towards smart cities has led to governments of various economies such as India and China to undertake construction projects. Construction workers are exposed to constant loud noises from heavy equipment and has caused government bodies such as the OSHA to establish regulations to protect employee hearing and health. The U.S. tactical communications market is anticipated to hold the highest share during the forecast timeframe. The high expenditure in the U.S for military communication gear and the presence of OSHA regulations are major factors contributing to the increase in demand. In 2016, the U.S department of Defence (DOD) has requested the government to increase the budget to USD 10.74 billion on the procurement and research of military communications, and electronics. Critical combat situations in Middle East and Africa is anticipated to contribute to high penetration of the tactical communications market. For instance, the intense internal conflict in Nigeria and Syria among the various conflicting parties is causing high expenditure on communication headsets. Government regulations to ensure the safety of the workers is anticipated to boost the tactical communications market growth as non-adherence to these regulations can hold the employer liable to legal action and lawsuits. OSHA has specified that employers are not allowed to expose their workers to sound levels higher than a certain range without the provision of protective head and ear gear. High risk tactical operations require continuous data interchange without external sound interference. 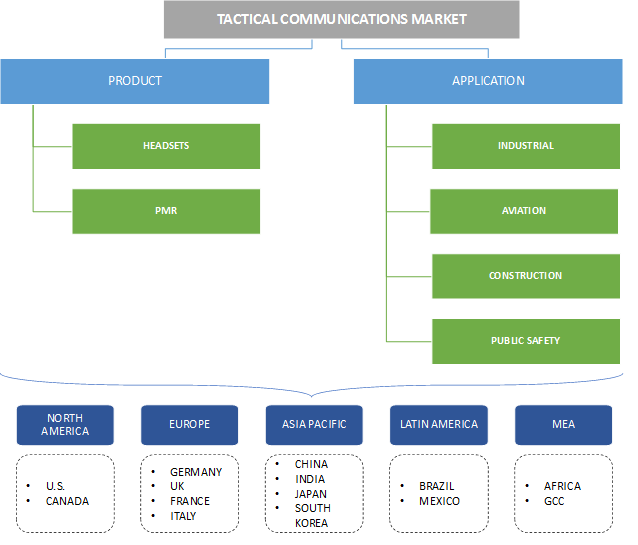 Companies operating in the tactical communications market include 3M, Sepura, Bose Corporation, Silynx Communications, FreeLinc Technologies Inc, Savox Communications, David Clark Inc, INVISIO Communications, Threat4, Marlborough Communications Limited, Motorola Solutions, and TEA Headsets. Companies invest highly in R&D to improve the quality of the data transmissions. Bose Corporation, for instance, developed aviation headsets that are equipped with customized audio prioritization and Bluetooth audio functionality. These devices are commonly used in critical situations and high stress locations such as war zones, burning buildings, construction sites in close proximity to intense environmental conditions, varying pressures, and others. The sensitive nature of the equipment places high emphasis on the need for standards and regulations and is anticipated to drive tactical communications market demand. Hence, the vendors operating in the tactical communications market are subjected to stringent regulations and standards. For instance, the equipment manufactured for military applications are expected to adhere to MIL-STD-810 and MIL STD 461e. These contain strict guidelines for the raw materials to be used in the manufacturing and the disposal of the used equipment. For instance, AS/NZS 1270:2002 specifies the requirements for the materials, design, performance, and testing of specialist acoustic hearing protectors. The tactical communications market is populated with a large number of SMBs and a few large companies. It provides several opportunities to component suppliers, manufacturers, distributors, and resellers, to generate revenue by creating awareness and the need for this product. These devices are adopted only by industrial and public safety users in bulk orders for protection or communication purposes. Advancements in technology such as bone conduction equipment for hearing impaired users and the improvement of radio transmission technology is revolutionizing the current technological landscape.